Coronary artery disease (CAD) occupies a central role in the etiology of heart failure (HF). It is estimated that CAD contributes to nearly 70 % of all HF cases in the United States—exceeding that of hypertension and valvular heart disease (Figure 1, Table 1). In patients with ischemic cardiomyopathy (ICMP), evidence suggests that initiation of early neurohormonal blockade coupled with revascularization may lead to favorable remodeling and improvement of ventricular function in selected patients. For these reasons, the detection of CAD and associated ischemia takes on a central position in the evaluation of patients with newly diagnosed HF. Distinguishing ICMP from nonischemic cardiomyopathy (NICMP) as the underlying substrate for HF symptoms has important implications in regards to the treatment and prognosis of these patients. The following chapter will examine the methods and clinical relevance of CAD detection in HF patients. How do you know your patient has ICMP vs NICMP? When presented with a patient with newly diagnosed HF, differentiation of CAD and ischemia as the underlying etiology of the cardiomyopathy can be challenging. Only 50% of HF patients with NICMP have truly “angiographically normal” coronaries. In addition, in patients with dilated CMP, varying degrees of CAD may be present, and teasing the contribution of ischemia from the background of preexisting ventricular dysfunction can be difficult. Furthermore, the presence of anginal symptoms or regional wall motion abnormalities on imaging studies are neither specific nor sensitive enough alone to delineate the cause of HF. Despite these challenges, defining the presence and extent of CAD remains the cornerstone in not only classifying the HF etiology but also in providing prognostic data. Bart et al analyzed data from 3,787 HF patients with systolic ventricular dysfunction—all of whom underwent coronary angiography. Patients were placed in the ICMP group (n = 3,112) if they had a history of myocardial infarction, percutaneous coronary intervention (PCI), coronary artery bypass graft surgery (CABG), or at least one major epicardial coronary artery with ≥75% stenosis; by default all remaining patients were defined as having NICMP (n = 675). Using this definition, and after multivariate adjustments, an ischemic etiology of HF was a significant predictor of mortality at 5 years. Furthermore, the angiographic extent of CAD was a stronger predictor of mortality than an ischemic or nonischemic etiology. Key Study: In an effort to develop a standardized definition of ICMP, Felker et al analyzed clinical and angiographic data from 1,921 HF patients from the Duke Databank for Cardiovascular Diseases. All patients had an ejection fraction (EF) ≤ 40% and underwent diagnostic coronary angiography. The authors studied several possible classification schemes of ICMP based on the number of epicardial vessels with ≥ 75% stenosis, history of myocardial infarction (MI), history of coronary revascularization (CABG or PCI), and the presence of proximal left anterior descending (LAD) or left main (LM) disease. Given the background data indicating a worse prognosis for patients with ICMP versus NICMP, this study attempted to test the ability of five different definitions of ICMP (based upon the above factors) to provide the most power to distinguish the prognoses between the two etiologies of HF. The adjusted (for age, ejection fraction, gender, New York Heart Association functional class, diabetes mellitus, and valvular heart disease) survival curves for the “traditional definition” of ICMP (the presence of any epicardial coronary vessels with ≥ 75% stenosis or any history of MI or coronary revascularization) is shown in Figure 2. The presence of CAD is the biggest risk factor attributed to HF development in the industrialized world. Figure 1 highlights the attributable risk from various risk factors to HF development in 13,643 subjects from the First National Health and Nutrition Examination Survey Epidemiologic Follow-up Study. These data appear consistent across multiple epidemiologic surveys, registries, and HF trials. Table 1 highlights several of these studies with the prevalence of CAD. With improvements in reperfusion therapy and post myocardial infarction (MI) care over the past 3 decades, the survival after MI has greatly improved. 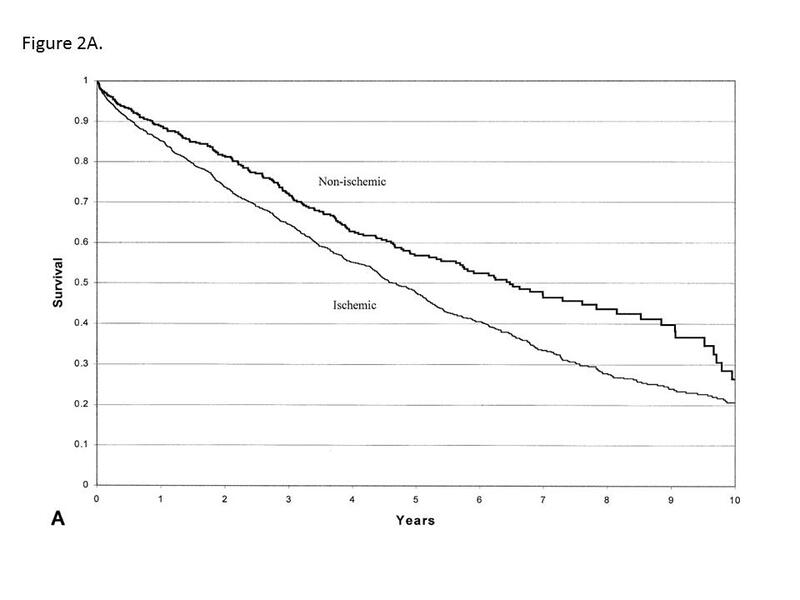 Despite the advancements in treating MI, HF incidence continues to rise post infarction. Velagaleti et al analyzed data from the Framingham study and compared the years from 1970 to 1979 with 1990 to 1999. The authors found that that the 30-day incidence of HF after MI rose from 10% to 23.1% (1970s compared with 1990s), while the mortality rate during the same period from MI declined from 12.1% to 4.1%. These findings were confirmed at 5 year follow-up as well and have been substantiated in multiple patient populations. Key Point: It is the aging of the population and the above referenced improvements in post MI care that largely underlie the HF epidemic in the United States. Approaches to patient with newly diagnosed HF: What diagnostic tests should be performed? As an initial approach to defining CAD presence, invasive coronary angiography (ICA) remains the gold standard test. The advantages of an invasive approach include direct luminal imaging of the coronary vessels, the ability to use intravascular ultrasound or fractional flow reserve to clarify the significance of intermediate stenosis, and the ability to obtain right- and left-sided intracardiac hemodynamics. In this context, invasive cardiac catheterization and coronary angiography have been invaluable tools in the stratification of patients with HF. These useful features of cardiac catheterization are reflected in the most recent guidelines from the 2009 updated AHA/ACC guidelines and are summarized in Table 3. Despite these recommendations, do all patients require invasive coronary angiography (ICA) to define the etiology of HF? Noninvasive techniques such as nuclear (single photon emission computed tomography [SPECT]) imaging and positron emission tomography (PET) scanning can detect ischemia, evaluate for viability, and may differentiate etiology of CMP in HF patients. However, to define the presence of obstructive CAD, two modalities are emerging as reliable alternatives to ICA: computed tomography angiography (CTA) and MRI with late gadolinium enhancement (LGE) imaging. Both modalities provide coronary vessel imaging, and the latter technology provides data on myocardial function and viability. The key limitations of invasive coronary angiography are the procedural complication risks. These risks include bleeding, stroke, MI, arrhythmia, renal failure, and death. Though the overall risk for a major complication is small (0.1% mortality), it is not trivial. In contrast, CTA provides a noninvasive method to define the coronary anatomy. Important limitations warrant mention and include the need for contrast, radiation dose (~4-11 mSv), and calcium artifacts, which may prevent luminal assessment. The feasibility of determining the etiology of HF was studied by Andreini et al who prospectively evaluated 61 patients with dilated CMP with both a 16-slice multidetector CT (MDCT) and ICA, as well as a cohort of patients with normal ventricular function as controls. There were no complications noted from the MDCT procedure while a surprisingly high 9.8% complication rate (acute heart failure and vascular complications) was reported for ICA. The feasibility in evaluating the cardiac anatomy was 97.2% in the CMP group with very high diagnostic accuracy for CAD detection (normal versus diseased), which was comparable to quantitative ICA. The authors noted a sensitivity of 99% (negative predictive value of 99.8%) for the presence of CAD in the CMP cohort. The specificity was slightly lower at 96%. Of note, the authors reported that artifacts in the CMP population were most likely related to increased ventricular filling pressure and a major artifact reported was enhancement of the coronary venous system in the CMP patients, which interfered with assessment of the left circumflex and posterior descending coronary arteries. More recently, Ghostine et al examined the ability of a 64-slice CTA to delineate ICMP from NICMP as compared with ICA in 93 patients with DCM. Similar to the Andreini et al study, the authors demonstrated excellent sensitivity for CAD detection (98%) but poorer sensitivity (90%). The sensitivity for a diagnosis of an ischemic etiology of heart failure was 90%, with a specificity of 95%. The test characteristics from this study are summarized in Table 4. The studies by Andreini and Ghostine taken together suggest that despite occasional artifacts, the high negative predictive value of MDCT makes this tool an alternative to invasive coronary angiography—with reduced rates of complications. The advantage of an MRI-based approach to defining the presence of CAD in the HF patients lies with the ability to use late gadolinium enhancement (LGE) to determine ischemic versus nonischemic patterns and to guide an assessment of viability. The theory and practical considerations of MRI-LGE are beyond the scope of this chapter and the reader is directed to an excellent review by Vogel-Claussen et al in the Radiological Society of North America, 2006. Several studies have examined the feasibility of differentiating the etiology of HF based on LGE data. Not only the presence and degree of enhancement but the pattern of gadolinium within the myocardium is helpful at deciphering the etiology of HF. This point is highlighted by the study by McCrohon et al. The authors examined the LGE pattern in 90 patients with HF and reduced systolic function. The presence of enhancement, higher gadolinium scores (transmural extent of enhancement), and endocardial enhancement were all associated with ICMP. None of the patients with ICMP had absent LGE or a mid wall enhancement pattern. Furthering these data, Soriano et al demonstrated the ability of MRI with LGE to differentiate ICMP versus NICMP using invasive coronary angiography as a gold standard. The authors found an overall sensitivity of 81%, specificity of 91%, and diagnostic accuracy of 87% in determining the presence of obstructive CAD in patients with HF and LV systolic dysfunction. KEY STUDY: Assomull et al prospectively evaluated the ability of MRI as a “gatekeeper” to ICA in patients with HF. The authors performed cardiac MRI with LGE on 120 patients with new onset HF of uncertain etiology. The following algorithm was used: if the LGE pattern was suggestive of ICMP then the patients underwent catheter-based coronary angiography. If the LGE pattern was confined to the mid wall (or no LGE was present), then the MR coronary images were examined. If the MR coronary images demonstrated no CAD, then the patient was labeled as NICMP otherwise the patient underwent ICA. The variety of LGE patterns and the correlation with direct coronary angiography are shown in Figure 4 and Figure 5. Using the above described algorithm, the authors found that the sensitivity, specificity, and diagnostic accuracy of LGE MRI (100%, 96%, 97%, respectively) were equivalent to invasive angiography (sensitivity, 93%; specificity, 96%; and diagnostic accuracy, 95%) for determining the etiology of HF. In addition, a cost analysis demonstrated that use of a MR based screening strategy prior to ICA was cost-effective. The data thus far for MRI suggests that this tool may have an important role in defining the presence of CAD in HF patients. MRI with LGE may reveal the etiology of HF and in patients with ischemic disease describe the extent of myocardial impairment and viability. Though limited in comparison to ICA and CTA, MR angiography also allows for visualization of the coronary vessels, which in contrast to nuclear and PET imaging makes it additionally attractive. How does the presence of CAD in the HF patient alter management? The presence of CAD by means of frank MI or chronic ischemia negatively impacts multiple aspects of cardiac function in HF patients, including myocyte apoptosis, neurohormonal activation, and adverse ventricular remodeling. Management of ICMP is centered on inhibition of these processes in an effort to preserve or improve ventricular systolic function. Guidelines for treatment with antiplatelet agents, use of statins (which may be particularly beneficial in HF patients), use of antianginal agents, smoking cessation, and incorporation of a “heart healthy diet” are similar to patients with CAD with no history of HF. However, important differences have been demonstrated between medication effects in NICMP versus ICMP patients. The specifics of several commonly used HF medications in the context of ICMP warrant mention and are summarized in Table 5. Understanding the impact of coronary revascularization on changes in ventricular function has been challenging. Historically, large randomized trials evaluating the impact of coronary artery bypass grafting on cardiovascular outcomes excluded patients with severely depressed left ventricular dysfunction. Furthermore, the presence and extent of chronic ischemia, acute stunning, hibernating myocardium, and fibrosis vary in individual patients making treatment planning challenging. To help with clinical decision making, assessment of myocardial viability has been the cornerstone of clinical decisions regarding revascularization. The gold standard for viability has relied on 18F-fluorodeoxyglucose (18FDG) positron emission tomography (PET) imaging. 18FDG-PET scanning enables the delineation of myocyte metabolic activity relative to perfusion. Additional modalities that have been studied extensively in this context include rest-redistribution thallium 201 SPECT, dobutamine ECHO, and MRI with LGE. The relative sensitivity and specificity of these modalities for the detection of viability is shown in Figure 6.
viability assessment prior to revascularization decisions. In an effort to critically assess this body of literature, Allman et al performed a meta-analysis of the collected literature. The key finding of the analysis, which included 24 studies, was a significant association between the presence of viability and survival. The magnitude of revascularization benefit is shown in Figure 7. Key Study: With these data as a background, Velazquez and colleagues performed a large randomized study comparing the benefits of medical therapy (n = 602) versus CABG + medical therapy (n = 610) in patients with severe left ventricular systolic dysfunction (EF ≤ 35%): The Surgical Treatment for Ischemic Heart Failure (STICH) trial. The primary outcome was the rate of death from any cause. Secondary endpoints included the rate of death from cardiovascular causes and the rate of death from any cause or hospitalization for cardiovascular causes. The key findings of the primary STICH study are shown in Figure 8, Figure 9, and Figure 10. The trial found no statistical difference in the primary endpoint of death from any cause (P = .120). The STICH trial found no statistical difference in the primary endpoint of death from any cause (P = .120). Modified from: Velazquez EJ, Lee KL, Deja MA, et al. Coronary-artery bypass surgery in patients with left ventricular dysfunction. N Engl J Med. 2011;364:1607-16. The STICH trial, which demonstrated a trend toward benefit from CABG, was demonstrated in terms of death from cardiovascular causes (P = .05). (Modified from: Velazquez EJ, Lee KL, Deja MA, et al. Coronary-bypass surgery in patients with left ventricular dysfunction. N Engl J Med 2011;364:1607-16. The STICH trial demonstrated a statistically significant difference in the rate of death from any cause or hospitalization for cardiovascular causes (P <.001). (Modified from: Velazquez EJ, Lee KL, Deja MA, et al. Coronary-artery bypass surgery in patients with left ventricular dysfunction. N Engl J Med 2011;364:1607-16. A trend toward benefit from CABG was demonstrated in terms of death from cardiovascular causes (P = .05), while a statistically significant difference was noted in the rate of death from any cause or hospitalization for cardiovascular causes (P <.001). Key Study: Bonow et al published a subgroup analysis of the STICH trial, which included an initial group of patients who had a viability assessment (using SPECT or dobutamine ECHO) prior to enrollment. As stated in the trial, a major focus of this analysis was to determine whether patients in the CABG group had better outcomes than those in the medical therapy only group among patients with viable myocardium, as compared with those without viable myocardium. The primary and secondary endpoints were the same as those for the primary STICH trial. 601 patients were enrolled, 487 of which had viable myocardium and 114 of which had no relevant viable tissue. Without accounting for baseline characteristics, the presence of viability was associated with a significant mortality benefit (P = .003, versus no viability); however, this difference was no longer present after multivariate adjustments (P = .210). At 5 years, there was no difference in the primary endpoint between patients with and without viability. The interaction between viability status and treatment assignment in terms of mortality is shown in Figure 11. Key Point: How should we interpret the STICH viability data? Will these data change clinical practice? The data should be taken in the context of multiple limitations, including a relatively smaller sample size (relative to the complete STICH trial), selection bias regarding use of viability, and lack of use of PET scanning—which has the highest sensitivity for viability. In addition, the authors pointed to a relatively lower death rate in the viable group treated with modern medical therapy only as compared to prior older studies in the field. Nonetheless, these data would suggest that in many patients with reduced systolic function and viable myocardium, modern evidence based medical therapy may be a reasonable option. Routine revascularization in these cases may not be universally beneficial. Ultimately, a case by case basis will still be required to evaluate the need for revascularization in an individual patient. Should we screen for CAD in patients with HFPEF? The majority of information underlying selection of imaging modalities, management algorithms, and guidelines discussed thus far have been derived from data obtained in patients with HF and reduced systolic function. As many as 50% of patients with newly diagnosed HF have a “normal or preserved” EF (HFPEF). Should we define the presence of CAD in these patients? No single unifying pathophysiologic mechanism for HFPEF has emerged in the literature. Reported pathologic findings have included impairments in myocardial relaxation, ventricular diastolic compliance, myocardial fibrosis, subtle systolic impairments, and abnormal ventricular-vascular coupling. These findings are not universal and the abnormalities responsible for the HF syndrome in these patients are quite heterogeneous. There has been interest in the contribution of age-associated comorbidities, including cardiovascular deconditioning, atrial fibrillation, hypertension, and diabetes, leading to and contributing to impairments in diastolic function. The role of CAD and ischemia must also be considered in this context—particularly as relaxation of myocytes is an energy-dependent process requiring intact myocardial perfusion. The prevalence of CAD in patients with HFPEF is not trivial and in several studies has been nearly 60%. The prevalence of CAD in several landmark HFPEF studies is shown in Table 6. CAD in these patients is unlikely an innocent bystander but may actively contribute to the diastolic abnormalities since both acute episodes of ischemia as well as chronic CAD have been shown to result in lusitropic dysfunction. Furthermore supporting this concept is the reported improvements in ventricular diastolic function following coronary revascularization. In the Coronary Artery Surgery Study (CASS) cohort of patients with HF symptoms and preserved EF, the additive impact of coronary stenoses on reduced survival was striking and is shown in Figure 12. Complicating treatment of patients with HFPEF is the difficulty in teasing apart the contribution of ischemia from other comorbid conditions. Clear guidelines for screening for CAD and revascularization in patients with HFPEF is unclear at this time. Based on existing data and general HF guidelines, significant ischemia or compelling anatomy should warrant consideration of revascularization. The clinical benefit in terms of HF symptoms and improvement of diastolic abnormalities in patients with HFPEF remains to be better studied. Di Carli, MF, Asgarzadie, F. “Quantitative relation between myocardial viability and improvement in heart failure symptoms after revascularization in patients with ischemic cardiomyopathy”. Circulation. vol. 92. 1995. pp. 3436-44.